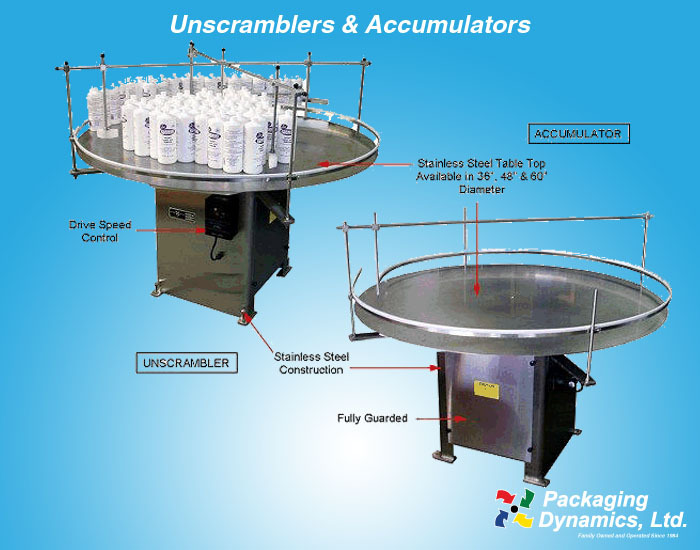 Accumulators & Unscramblers - Packaging Dynamics, Ltd.
Packaging Dynamics, Ltd.’s Unscramblers are engineered to provide an organized avenue for feeding containers to our Filling Machines. Coupled with UHMW guide arrangements, containers can be placed on the table surface and they will be correctly delivered to the filling line. 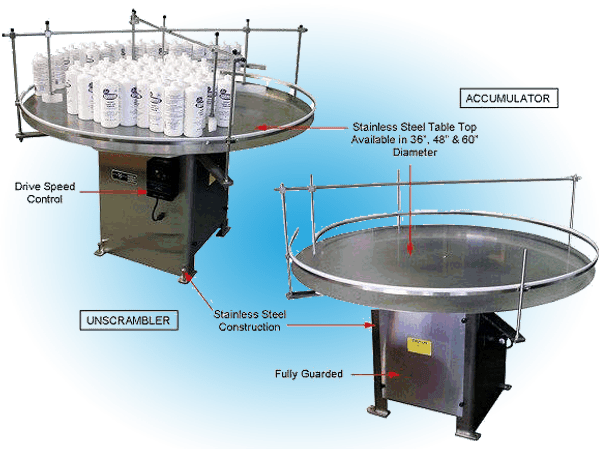 Packaging Dynamics, Ltd.’s Accumulators have proven to be a convenient means of collecting and removing filled containers from the filling line in an organized fashion making it much easier for the customer to organize products. Our Unscramblers and Accumulators are constructed of mild steel which provides for easy cleanups with a minimum amount of down time. The variable speed design provide easy timing with the filling machine conveyor speeds. They can be manufactured with Nema 4 or explosion-proof electrics. Transfer Plates and Dump Tables are also available!